By now everyone from all corners of the snow covered globe have heard the story of the boy from Bethel who returned home, beaten up from eleven hard fought days in Sweden, an even longer season of filming, a rough stretch of competitions, and a nasty fall at the King of Quarters, to conquer his fear and effectively launch himself into the record books with the highest air on a quarter pipe. 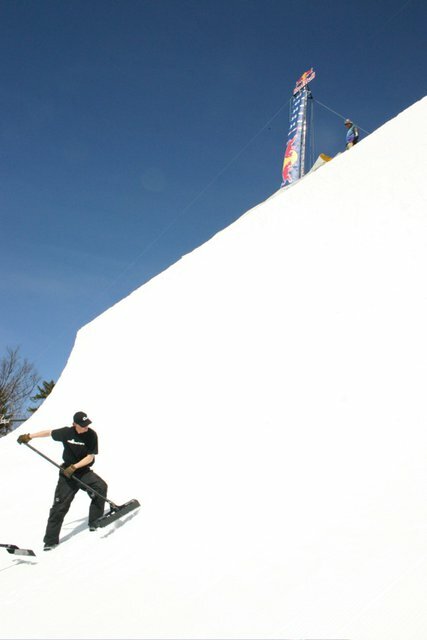 The massive quarter pipe built by Snow Park Technologies. 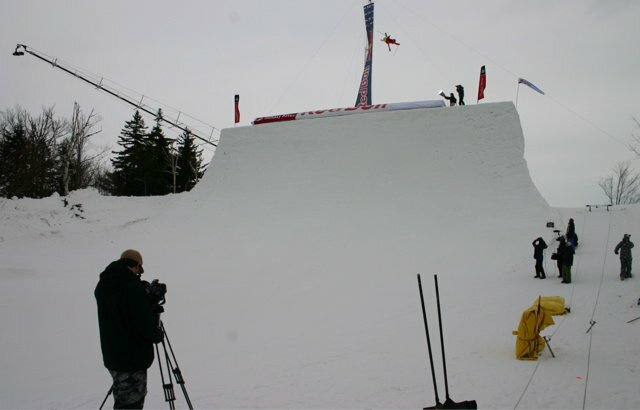 SPT worked tirelessly to keep the quarter pipe in perfect condition. 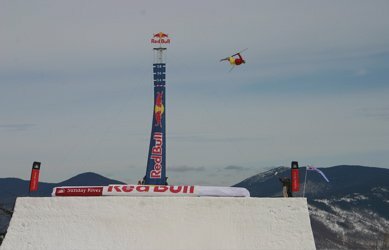 On Monday night the media, Red Bull, and Sunday River gathered in a small conference room of the Grand Summit Hotel.&nbsp; The representatives from Red Bull outlined the itinerary for the week and discussed the manner in which we would release information if and when the record was broken. Spirits were generally high among the group as we were all excited to potentially witness a world record right before our very eyes. However the laughter was short lived after the subject everyone in the room was skating around was brought up. 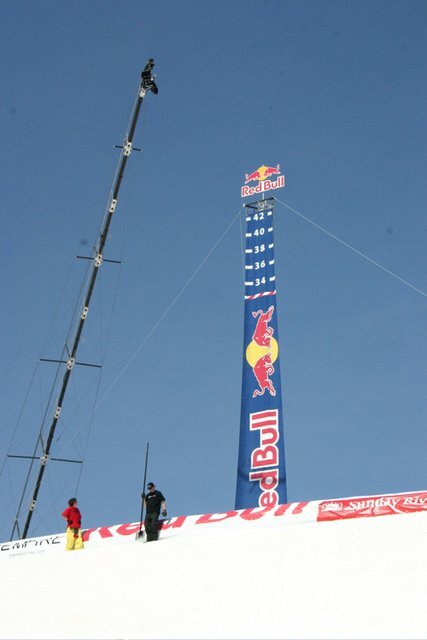 &ldquo;What happens if he falls seventy feet to the flat bottom?&rdquo; Thoughts of Jake Brown from the 2007 Summer X-Games filled my head. 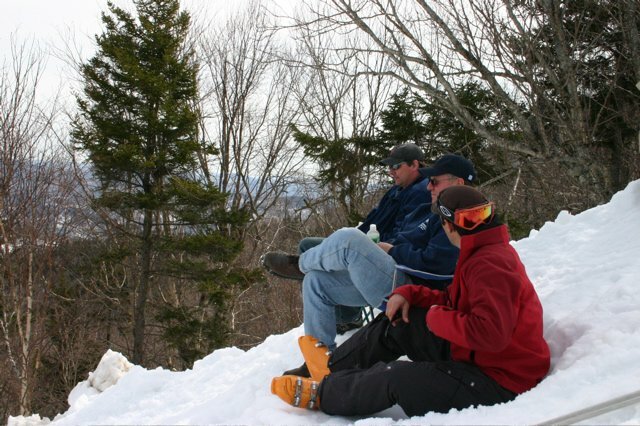 Representatives from Sunday River went over the emergency course of action if the worst was to happen. A deafening silence filled the room as thoughts of how incredibly dangerous this stunt was moved to the forefront of everyone&rsquo;s mind. 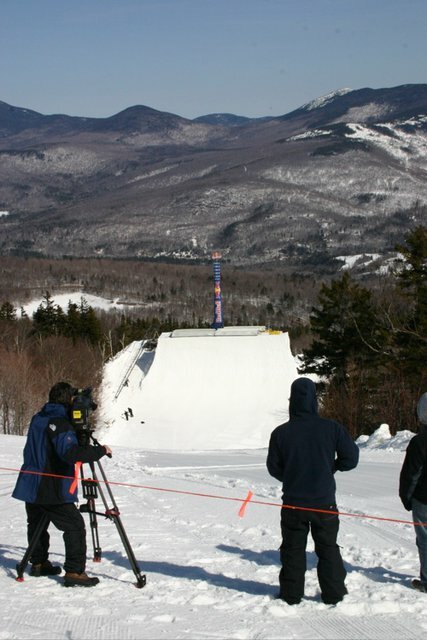 Dumont takes his first look at the quarter pipe. Dumont warming up with his trademark 540 on the first day. 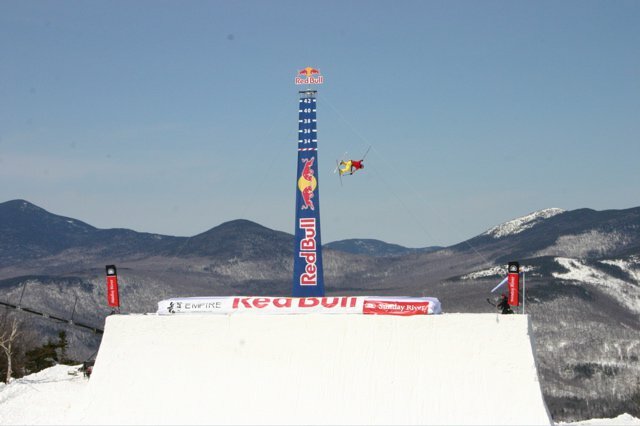 Tuesday morning Simon Dumont arrived off a sleepless twenty-seven hour flight from Sweden and five hours of miserable sleep to a 38-foot custom built quarter pipe manufactured by Snow Park Technologies and Sunday River. Joining him on slope were his family and friends. Barbara and Francis Dumont, Simon&rsquo;s parents, watched as their son launched his trademark 540 smoothly and consistently hit twenty-five feet off the deck. It was easy to feel overconfident and think the record could be broken in one day. Dumont sizing up the competition. Dumont free falls from fifty plus feet. Then, on what would be his final hit of the day, Simon disastrously fell fifty-five feet to flat. Thankfully, he had the strength to spin out of what could have been a much more devastating fall. However the fall did not go without injury as Dumont banged his heel when hitting the hard packed snow. He would need medical treatment in order to walk. The record was slightly further away than we arrogantly anticipated. Wednesday morning Simon would hobble himself out to the snow, clearly showing signs of his problematic knee and heel injury. Still, the twenty-one year old did his best, trying his hardest to break the record until slamming his heels hard on the deck, thus causing more damage to his already painful injuries. Once again medical treatment would be needed and the record was looking less and less attainable. 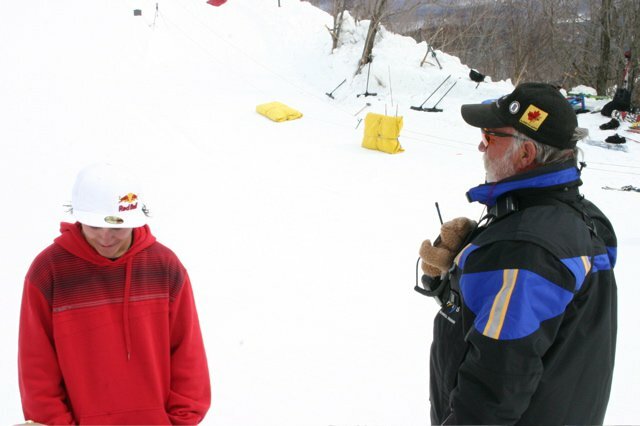 Sunday River's Alex Kaufman and Francis Dumont discussing the attempt. Spirits were beginning to dwindle but that night the Dumont family graciously invited the media and sponsors into their home for dinner and entertainment. It gave us time to step back and not think about the misfortunes of the previous days. It allowed the crew to regain some of our lost hope. Thursday was cancelled due to high winds that would graciously allow Simon one more day to recover. Arriving that day from Stockholm was none other than Colby James West and Empire Team Manager Jake Largess. 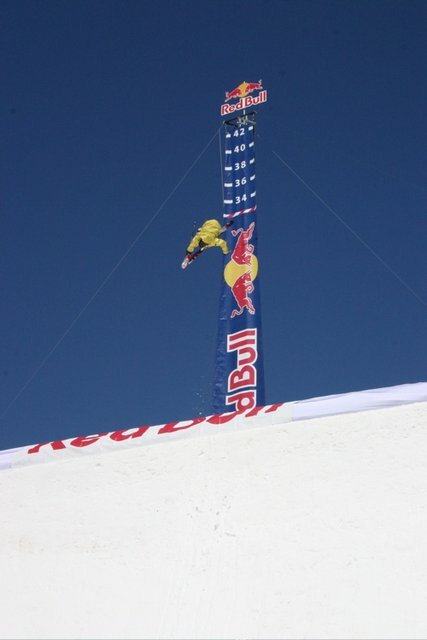 Colby West launches the quarter pipe. Filmer Riley Poor watches his friend launch the quarter pipe with a textbook 900. As anyone can attest, having good friends with you can always help a difficult situation. Colby&rsquo;s arrival was a godsend and his good-natured sense of humor would keep the entire crew loose. Friday morning Simon would again step onto snow and in the 11th hour of the event, would again attempt to launch higher on a quarter pipe than any other human being in the world had ever gone before. The morning began with Colby, Simon, and Jake sessioning the quarter pipe. Colby began launching higher and higher, one time coming close to breaking the record himself with a mute grab! This was enough to get the Dumont fired up as he sped at upwards of fifty-five mph into the gargantuan snow mass with vindication in his eyes. 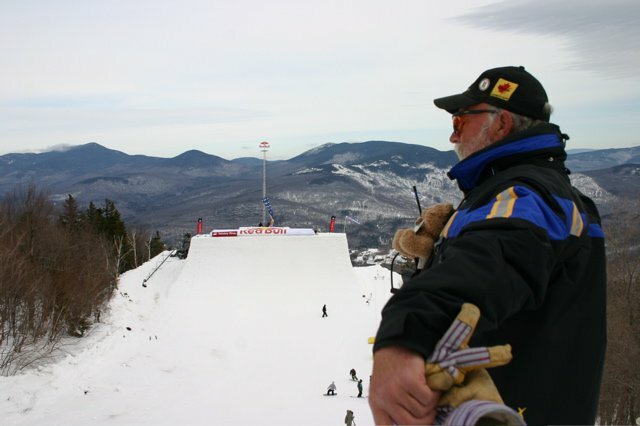 &quot;Bear&quot; - the FIS Representative in charge of submitting the record to Guinness. The eruption from the small crowd was thunderous as the Dumont landed and skied away cleanly. 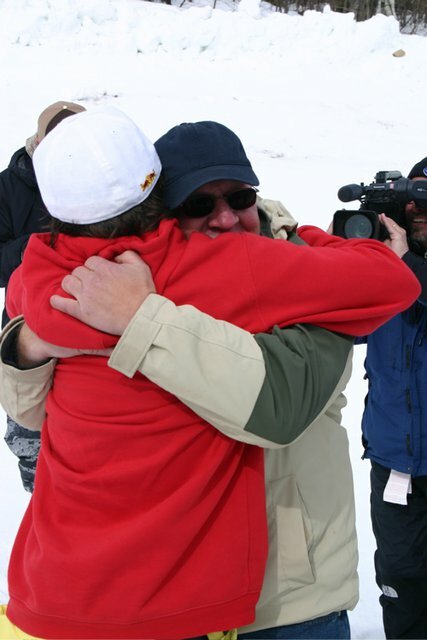 The first to congratulate Simon, with huge hugs and loving praise, were his parents followed by his agent, Michael Spencer, filmer and friend Riley Poor, and his brother Adam. The proud mother and her son share a moment. &quot;I'm just so proud of him.&quot; - Francis Dumont after witnessing his son's record breaking air. Colby congratulating his good friend. Dumont speaking with the media about breaking the record. The entire SPT crew cannot be thanked enough for their tireless work and effort. Smiles could not be wiped away from anyone&rsquo;s face as we had all just witnessed the incredible and what for a few days seemed impossible. As media, family, and friends shook hands and exchanged hugs, I noticed Simon look up at the height meter and give a truly genuine smile. The day was his and no one could take it from him. The high flying American sent it to the moon, but does the difference in setup disqualify him? The final slopestyle world cup of the season goes down under sunny skies in Italy and the overall world titles are decided. 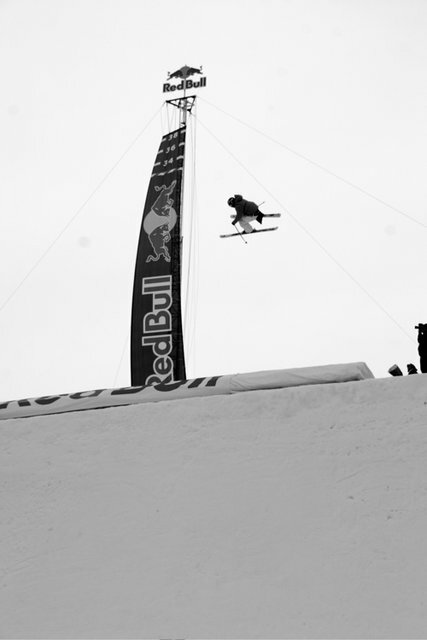 The last slopestyle world cup of the season went down in Corvatsch, Switzerland and the course was a beauty.